Forest Lake is a city in Washington County, Minnesota, United States. It is twenty-seven miles northeast of Saint Paul. The population was 18,375 at the 2010 census. The 2016 population is 20,216. It is located on one of Minnesota’s 100 largest lakes. The lake serves as the source of the Sunrise River. Other main routes include County Road 2–Broadway Avenue. Interstate 35 splits into Interstate Highways 35E and 35W just south of Forest Lake in the nearby city of Columbus. The junction is commonly referred to as the Forest Lake Split. The Forest Lake Split was the scene of the August 11, 2003 death of Herb Brooks, coach of the gold medal-winning 1980 U.S. Olympic Hockey Team (Miracle on Ice). 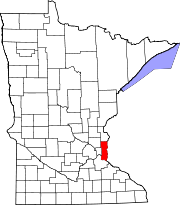 Forest Lake is home to the Minnesota Mullets of the United States Premier Hockey League (USPHL) Elite Division. The Tin Man (the old Forest Lake water tower) was dismantled on November 9, 2006. Cedar Park, with its “Forest Dragon”, installed in 2015. Forest Lake is home to Minnesota’s biggest black ash tree, which stands near Sunrise Creek, on North Shore Drive. The tree, which has held the title since 1998, stands 65 feet (20 m) tall and has a 47-foot (14 m) crown spread. The Ballpark at Schumacher Field, located on one of the Independent School District 831 campuses, was named the 2016 Field of the Year for the state of Minnesota, and is one of eight 2016 finalists in the U.S. for High School Baseball Field of the Year. The forest Lake Area school system includes 9 elementary sites, 1 junior highs site, and 1 high school site independent district – North Lakes Academy. There is also an area learning center located at the former Central Junior High School site.